Trees are dying across Yosemite and Yellowstone national parks. Glaciers are melting in Glacier Bay National Park and Preserve in Alaska. Corals are bleaching in Virgin Islands National Park. Published field research conducted in US national parks has detected these changes and shown that human climate change – carbon pollution from our power plants, cars and other human activities – is the cause. As principal climate change scientist of the US National Park Service, I conduct research on how climate change has already altered the national parks and could further change them in the future. I also analyze how ecosystems in the national parks can naturally reduce climate change by storing carbon. I then help national park staff to use the scientific results to adjust management actions for potential future conditions. Research in US national parks contributes in important ways to global scientific understanding of climate change. National parks are unique places where it is easier to tell if human climate change is the main cause of changes that we observe in the field, because many parks have been protected from urbanization, timber harvesting, grazing and other non-climate factors. The results of this research highlight how urgently we need to reduce carbon pollution to protect the future of the national parks. Human-caused climate change has altered landscapes, water, plants and animals in our national parks. Research in the parks has used two scientific procedures to show that this is occurring: detection and attribution. Detection is the finding of statistically significant changes over time. Attribution is the analysis of the different causes of the changes. 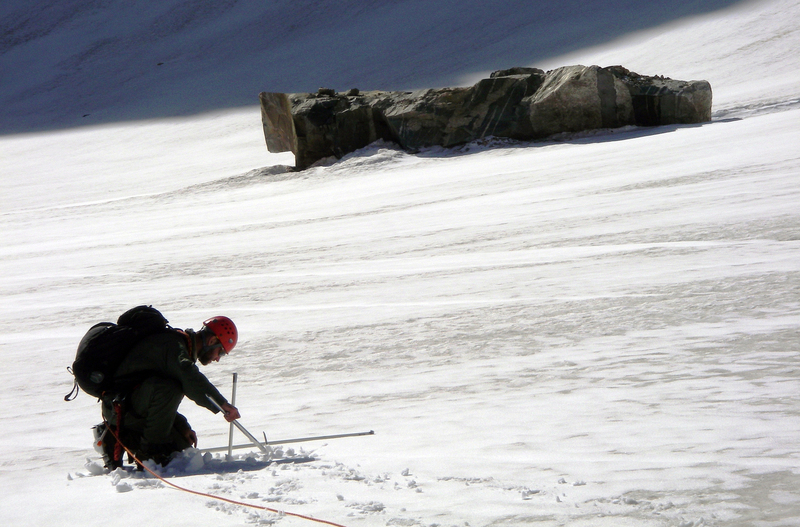 Around the world and in US national parks, snow and ice are melting. Glaciers in numerous national parks have contributed to the global database of 168 000 glaciers that the Intergovernmental Panel on Climate Change (IPCC) has used to show that human climate change is melting glaciers. Field measurements and repeat photography show that Muir Glacier in Glacier Bay National Park and Preserve in Alaska lost 640 meters to melting from 1948 to 2000. 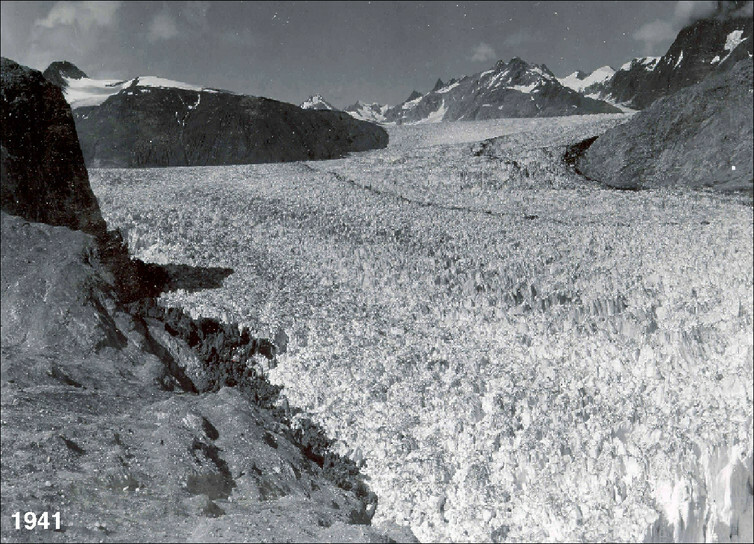 Muir Glacier, Glacier Bay National Park and Preserve, 1941. Photo by William O. Field, courtesy of the National Park Service, National Snow and Ice Data Center, and US Geological Survey. 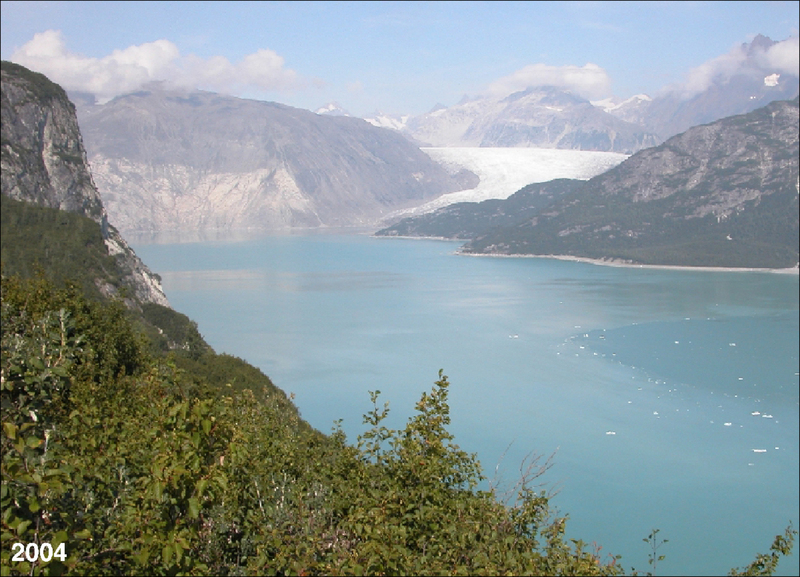 Muir Glacier, Glacier Bay National Park and Preserve, 2004. Photo by Bruce F. Molnia, courtesy of US Geological Survey. In Glacier National Park in Montana, Agassiz Glacier receded 1.5 kilometres from 1926 to 1979. Snow measurements and tree cores from Glacier National Park, North Cascades National Park, and other national parks contributed to an analysis showing that snowpack across the western US has dropped to its lowest level in eight centuries. Climate change is raising sea levels and heating ocean waters. Golden Gate National Recreation Area in California hosts the tidal gauge with the longest time series on the US West Coast. That gauge has contributed to the global database that the IPCC used to show that human climate change has raised sea level 17 to 21 centimetres in the 20th century. Measurements of sea surface temperatures by ocean buoys in Buck Island Reef National Monument, Channel Islands National Park, and Virgin Islands Coral Reef National Monument have contributed to a global database that IPCC has used to show that human climate change is heating surface waters at a rate of 1.1 ± 0.2 degrees Celsius per century. On land, climate change is shifting the ranges where plants grow. A global analysis that colleagues and I published in 2010 found that, around the world, climate change has shifted biomes – major types of vegetation, such as forests and tundra – upslope or toward the poles or the Equator. This type of research requires long-term monitoring of permanent plots or reconstruction of past vegetation species distributions using historical information or analyses of tree rings or other markers of the past. In the African Sahel, I uncovered a biome shift by hiking 1,900 kilometres, counting thousands of trees, reconstructing past tree species distributions through verified interviews with village elders and counting thousands of trees on historical aerial photos. Research has documented biome shifts in US national parks. In Yosemite National Park, subalpine forest shifted upslope into subalpine meadows in the 20th century. In Noatak National Preserve, Alaska, boreal conifer forest shifted northward into tundra in the 19th and 20th centuries. Wildlife is also shifting. 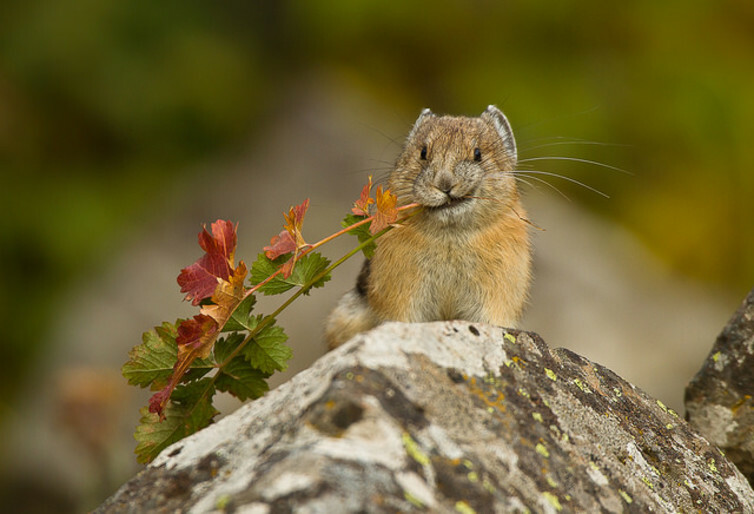 In Yosemite National Park, scientists compared the species of small mammals they captured in 2006 to the species originally captured along an elevation transect from 1914 to 1920 and showed that climate change shifted the ranges of the American pika and other species 500 metres upslope. Across the United States, the Audubon Society organizes its annual Christmas Bird Count in numerous national parks and other sites. Analyses of bird species results from 1975 to 2004 and possible local causes of changing distributions found that climate change shifted the winter ranges of a set of 254 bird species northward. Examples include northward shifts of the evening grosbeak (Coccothraustes vespertinus) in Shenandoah National Park and the canyon wren (Catherpes mexicanus) in Santa Monica Mountains National Recreation Area. Climate change is driving wildfires in and around many national parks in western states. Fire is natural and we need it to periodically renew forests, but too much wildfire can damage ecosystems and burn into towns and cities. Field data from 1916 to 2003 on wildfire in national parks and across the western US show that, even during periods when land managers actively suppressed wildfires, fluctuations in the area that burned each year correlated with changes in temperature and aridity due to climate change. Reconstruction of fires of the past 2,000 years in Sequoia and Yosemite national parks confirms that temperature and drought are the dominant factors explaining fire occurrence. Climate change is killing trees due to increased drought, changes in wildfire patterns and increased bark beetle infestations. Tracking of trees in Kings Canyon, Lassen Volcanic, Mount Rainier, Rocky Mountain, Sequoia and Yosemite National Parks has contributed to a database that revealed how climate change has doubled tree mortality since 1955 across the western United States. High ocean temperatures due to climate change have bleached and killed coral. 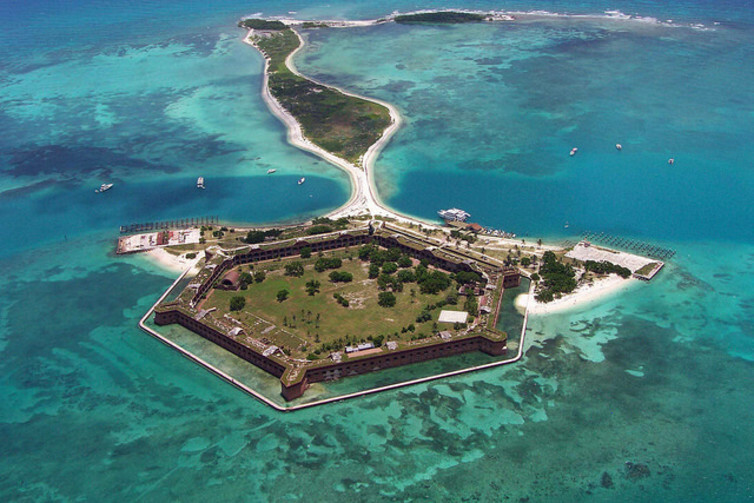 In 2005, hot sea surface temperatures killed up to 80% of coral reef area at sites in Biscayne National Park, Buck Island Reef National Monument, Salt River Bay National Historical Park and Ecological Preserve, Virgin Islands National Park and Virgin Islands Coral Reef National Monument. When the US Congress established the National Park Service a century ago, it directed the agency to conserve the natural and cultural resources of the parks in ways to leave them “unimpaired for the enjoyment of future generations.” By altering the globally unique landscapes, waters, plants and animals of the national parks, climate change challenges the National Park Service to manage the parks for potential future conditions rather than as little pictures of a past to which we can no longer return. For example, Yosemite National Park resource managers plan to use climate change data to target prescribed burns and wildland fires in areas that will be different from the areas selected using estimates of fire distributions from the 1850s. At Golden Gate National Recreation Area, resource managers have examined stewardship plans resource-by-resource to develop actions that account for climate change. At Everglades National Park, managers are using sea level rise data to help plan management of coastal areas. Continued climate change is not inevitable. It is in our power to reduce carbon pollution from cars, power plants and deforestation and prevent the most drastic consequences of climate change. In the face of climate change, we can help protect our most treasured places – the national parks.